Personally, I agree most with the violist, about the piano concerto in particular, which I would suggest has a raw edge. 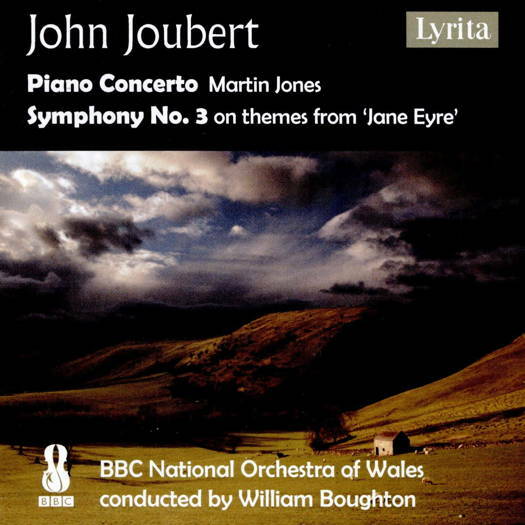 This is partly because orchestral timbres ravished Joubert so powerfully that he could not resist them: it is - very nearly - a piano symphony; while Martin Jones responds almost as often as he leads, with marvellous sensitivity. The restless opening movement features a thrusting motif of repeated notes, as well as lyrical piano triplets commented on by solo horn, followed by a section where the winds - ultimately unsuccessfully - attempt to boss the strings. There is wonderful shaping in Martin Jones' phrases, and a powerful summation - which finally drops away. The brass play a major role, subduing the pianist into a subtly underplayed, almost sardonically unbombastic conclusion. The second movement is launched by Jones in more experimental vein, with feathery orchestral commentary - but, as so often with Joubert, the underlying emotional intensity eventually wins through, loosing runs in the piano amidst open harmonies. Listen out for fleeting moods, piano roulades beneath high winds, and a dotted-note theme underpinned by trumpets and piano, the whole culminating in a strong climax. With the heavy brass answering the strings, and the timpanist in full flow, even the soloist is momentarily silenced. When he returns, it is with insoucience: light, fragrant and graceful. The BBC National Orchestra of Wales' admirable solo horn rises beautifully to a spotlight, in an extended solo, supported by Martin Jones, with commentary from the other wind principals. We are back in the fiery territory of the opening movement in the long, richly-textured and complex finale - although it starts philosophically enough, with the soloist recollecting the first movement's fifths and octaves. A swift-flowing Allegro ensues, again featuring timbres and harmonies reminiscent of the first movement. Its repeated notes give the movement something of the same nervy feel, but, before the cadenza, it turns playful and offbeat. After a masterful cadenza - at times improvisatory, sometimes ruminating and (here, at least) always brilliantly controlled - the soloist unleashs the orchestra into an affirmatory recapitulation of the Allegro. William Boughton conducts with great sensitivity, and the orchestra excels. Jones' sympathy for Joubert is also exemplary: he has a chamber musician's sense of when to dominate and when to shade his colours. Symphony No 3 started off its life in a version for chamber orchestra, and it retains that chamber music, very intimate feel. It is impossible for one conversant with Joubert's operatic masterpiece not to hear, in the thudding timpani, in the violin cries, the actual sung version of Jane's rebellious spirit and some of the more passionate scenes. Though originally inspired by those parts of Jane Eyre left on the cutting-room floor, Joubert also incorporates some of the highlights of the work, and much of its subtleties. It begins with a hazy, anticipatory opening of Jane Eyre turning her back on the school where she was exploited, but in the second section ('Thornfield House') the oboe produces a warm, almost bucolic feel, with flute and harp. In the turbulent third section - representing the collapse of the abortive wedding - the wedding march theme is brilliantly undermined by Jane Eyre's own restlessness, her hopes collapsing amidst jeers from xylophone and shrill first violins. The last movement - perhaps the strongest of all - recapitulates much of the themes of the previous movements, woven persuasively and organically together, and finishing on a note of irresistible power. Listening to this, it's hard to believe that its inspiration was from the cutting-room floor. William Boughton conducts with great feeling, and every player in the BBC National Orchestra of Wales sounds full-throated and fully committed - but then, what musician could fail to respond to such gloriously dramatic music? One major question remains unresolved: Where is the opera company that will fully stage Joubert's only opera? This symphony only makes one long all the more for that day to come - as, someday, surely, it must.